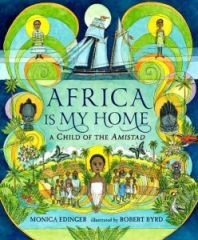 Author Monica Edinger was intrigued with the story of the Amistad when she visited the museum in Mystic, Connecticut dedicated to it, and because she had lived for two years in the very region of Sierra Leone where the Amistad captives once lived. But she also had the good fortune of discovering a large number of largely unknown and unused primary sources about Margu, whose remarkable story not only included her captivity, the famous court case and her eventual return to Mendeland in Sierra Lone, but also a later return to the United States, and graduation from Oberlin College. This body of research might well have ended up as an academic project but Edinger, an educator decided to make it a children’s book. It was a good decision, for this is a story well told, a story of Africa, of perseverance and ultimately of a human view of the slave trade. The Amistad captives collectively are better known from original sources than just about any other body of slaves in the Americas, thanks to the interest that they generated during the celebrated trial. This material, plus Edinger’s feel, from experience, of Sierra Leone, gives this story a fine feel of the emotions of being torn from home and family, and of persevering and overcoming adversity.